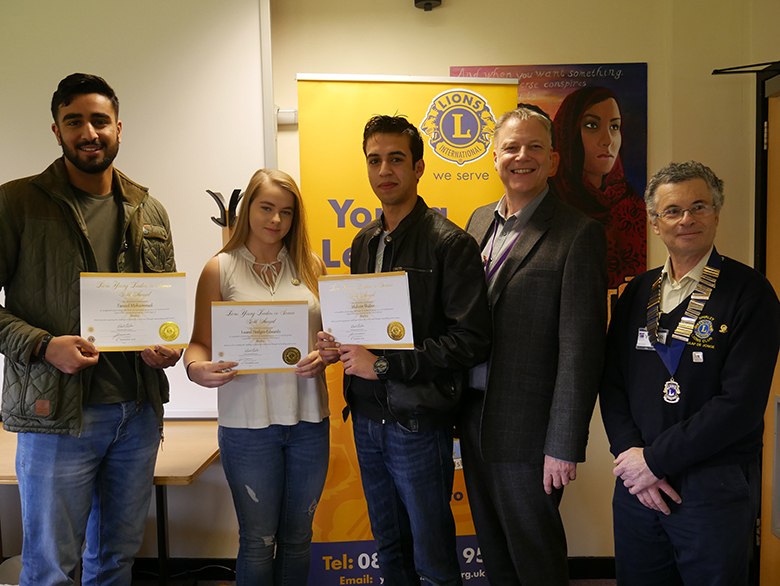 Three community-minded students at The Sixth Form College, Solihull have received awards from Shirley Lions for their voluntary work. Fareed Mohammed, Lauren Hodges-Edwards and Mohsin Shabir each got Gold Awards for completing 100 hours of community service. Fareed volunteered as a cricket coach to get his award, while Lauren worked in a charity shop and went on a volunteering trip to The Gambia with the College. Meanwhile, Mohsin volunteered at his local mosque. All three students contributed to their local communities in a very positive way. Jaap De Jonge, President of Shirley Lions, came into College with colleagues Jacqueline Culliford and Karen Barker from the Youth Committee, to present the awards to the students. Shirley Lions Club, which formed in 1977, is part of Lions Club International, which is the largest service club organisation in the world, with 1.3 million members in 208 countries. Members volunteer their time for humanitarian and community causes. The College encourages students to complete voluntary work to boost their applications or employment and university and to develop important skills that will aid them in later life. One way is by joining the College’s Team Gambia project, which sees students raising money for an impoverished school in The Gambia and then volunteering in the school for a week. Other ventures include The Big Sleep Out which involves students sleeping outside on campus under cardboard and plastic sheeting to raise money for St Basil’s homeless charity. The College also rewards students for volunteering and work experience with something called the Career Passport. This scheme encourages students to develop the skills that employers and looking for by way of work experience, internships and voluntary work, which the scheme classifies as Professional Development Activities. 35 hours of Professional Development Activities gets students a Bronze Career Passport, 70 hours will lead to a Silver Career Passport and 100 hours equates to a Gold Career Passport.